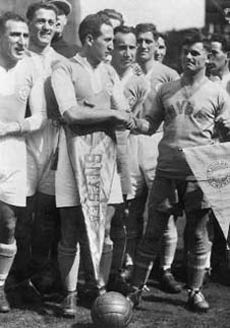 Hakoah-Vienna was an all-Jewish social-athletic club, who’s celebrated soccer club won Austria’s National Championship in 1924-25, and finished second in 1921-22. 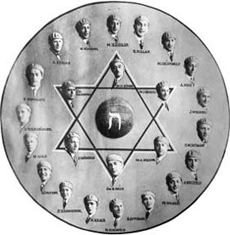 This outstanding team attracted Jewish soccer stars from many countries and gained worldwide reputation throught its many travels. Hakoah-Vienna was the first international club to defeat an English team in England, when it decisively romped past Great Britain’s Westham of London Club 5–0 in 1923. Hakoah-Vienna’s top players include Jozsef Eisenhoffer, Sandor Fabian, Richard Fried, Max Gold, Max Grunwald, Jozsef Grunfeld, Bela Guttmann, Alois Hess, Moritz Hausler, “ Fuss” Heinrich, Norbert Katz, Alexander Nemes-Neufeld, Egon Pollak, Max Scheuer, Alfred Schoenfeld, Erno Schwarz, Joseph Stross, Jacob Wagner, and Max Wortmann. of sports activities. With the rise of Nazism, the club disbanded in 1941, reestablishing itself after World War II on a modest scale.